There are many websites out there saying that one brand of premium halogen headlights are better than the other. One such site, for example, touts that the Sylvania SilverStar halogen headlights are able to provide “up to 30%” greater visibility down the highway. That sounds like an impressive feat until you read the fine print, which states, “compared with older, worn standard halogen” headlight bulbs. Despite the fine print, these types of claims are making the more premium-priced halogen headlights bulbs an alluring choice for many drivers. In order to compare how those premium halogen headlights bulbs stack up against one another, we hired an independent firm to put eight of them, costing from $20 up to $80, through a variety of tests. They tested the low-beam headlight performance of (9003) single-filament and (H7) dual-filament halogen headlights from Phillips, GE, Sylvania, and Hella, and also PIAA’s dual-filament bulb. The testers also compared the premium bulb’s performance against that of two regular standard halogen bulbs from Helio and GE, which cost $10 and $20, respectively, and also to the (OE) original-equipment halogen headlights bulbs that came with our 2013 Volkswagen Passat and Hyundai Accent test cars. The testers found that, as a group, the premium halogen bulbs, provide a whiter light and upwards of 19% more light output than the OE or standard bulbs. This extra light may be more pleasing for some drivers. However, none of the premium halogen bulbs allowed the test drivers to see farther down on the headlight test course than the OE or standard halogen headlights bulbs. This is because the light distance is determined more so by the shape and size of the headlamp’s lens or reflector than by the actual bulb. The testing facility also found little to no difference in the light being output among the different premium bulbs. There were only minor variances due to power fluctuations while driving. If you prefer a whiter or more intense light, premium halogen headlights bulbs might be a solid choice for you. However, don’t expect big changes in terms of the distance that you can see when compared with new OE or standard halogen bulbs. Overall, during our testing, we really liked the Phillips Diamond Vision Halogens. We felt that they provide a slight advantage, in terms of brightness, over the other brands tested. You can find these and other brands tested that fit your car by using our HEADLIGHT FINDER TOOL. Remember that the illumination of any headlight bulb will fade over time, so we recommend that you replace your headlight bulbs every 3-4 years. Waiting until one of the headlights burns out could get you a costly citation from the local police. We strongly advise that you don’t mix standard and premium halogen headlights bulbs. Keep in mind that light output can also decrease if the headlamp lenses become dirty or hazy. You should get them cleaned by a professional or you may consider doing it yourself with a handy product like the Sylvania Headlight Restoration Kit, which costs right around $20. For a look at xenon vs halogen bulbs, check out out headlight showdown. You have probably heard about xenon headlights for cars, and you may be wondering if you should install them. Today, we tackle that very question. Should you install xenon headlights? Who Should Install Xenon Headlights? The short answer to this question is: it depends. It is true that xenon headlights will give your car a higher luminous efficiency. However, there are many factors that go into determining whether installing xenon headlights is right for your vehicle or not. Now let’s take a closer look as to whether you should install xenon headlights or not. First, however, you should know that not all High Intensity Discharge (HID) headlights use Xenon gas as the weapon of choice. Some xenon headlights actually use Mercury vapors or other types of metal halide. Additionally, some use ceramic metal halide while yet others use a Sodium vapor. Secondly, all automotive applications of xenon headlights use Xenon, but they don’t all this gas for the entire functioning time. With that bit of information, let’s now take a look at how they actually work. Despite them commonly being referred to as “xenon headlights”, most HID lights are actually metal halide lamps which contain Xenon gas. The gas is only minimally used to allow the headlamp to produce a very small amount of light immediately after the power is applied. This is done to accelerate the longer warm-up time of the lamp. Their distinct blue color separates xenon headlights from the regular halogen headlights with tungsten filaments. Despite the fact that they produce a greater amount of light emission for the amount of electricity power used, xenon headlights are still most commonly used in low-beam headlights and very rarely on high-beam headlamps. This proportion does vary by the geographical area, however. For example, when we compare international ECE standards (which are recognized all around the world) with the SAE standard of the United States, we can then see that in the United States more glare from headlights is permitted and is actually required. Stated another way, Americans buying HID/Xenon kits are buying them not simply due to the typical American’s buying power, but more so due to the permissive legislation. Because of the higher energy required to operate and install xenon headlights, the HID bulbs will not run on regular low-voltage DC current. Therefore, aftermarket xenon headlights will require a ballast (power pack) with either an internal or external ignitor which is used to control the current sent to the headlight bulb. Considering that cars utilize a 12-volt electrical system for their stock headlamps and the aftermarket xenon headlights require over 20,000 volts to light the lamps and then use about 85 volts to keep them running, the ballast (power pack) is a mandatory part of the system. Besides turning on the headlights, the ballast also regulates the voltage and is an essential part of the HID headlight system. Xenon headlights power-up their bulbs in three phases. First of which is the ignition, whereby a high voltage pulse is utilized to produce a spark which in turn ionizes the Xenon gas. This creates a tunnel of electrical current between the Tungsten electrodes. After the happens comes the initial phase, during which the temperature inside of the xenon bulb capsule rises very quickly causing the metallic salts to vaporize, and the resistance between the different electrodes fails. After this stage, the ballast performs it’s function and switches automatically to continuous operation. When all of the metal salts are in the vapor phase is when the arc of light will achieve a stable shape and the optimal luminous output has attained its nominal operating value. The arc will not flicker, as it is being fed with stable electrical power supply by the ballast. One of the main advantages to install xenon headlights is the added safety allowed by the more usable light when compared to regular Halogen headlights. A few other advantages are the luminous efficacy, the decreased power consumption, and the increased longevity. It is estimated that the average true lifespan of a xenon headlight is approximately 2000 hours, compared to a halogen headlamp that has between 450 – 1000 hours of life. On the other hand, some of the disadvantages vary by your location. As we stated earlier, some areas have more permissive legislation than others. For example, cars equipped with HID headlights are required by international ECE regulations to also be equipped with automatic beam leveling control and lens cleaning systems in order to minimize the high levels of glare produced for other drivers on the road. SAE legislation acknowledges and permits this rule in the United States, but it does not really get enforced. Another big disadvantage comes from the lack of backward-compatibility between xenon headlights and traditional Tungsten-Halogen headlamps, thus requiring special optics in order to collect and disperse the light on HID headlights. Compared to traditional halogen headlights, the cost of producing, repairing, installing, and purchasing xenon headlights is also a good bit higher. So, Should You Install Xenon Headlights? We think so. You will want to check with your local laws and regulations, however. But, we feel that the improved styling and safety that you get when you install xenon headlights outweighs any drawbacks and associated costs. Be sure to use our great xenon headlights selection tool to easily find the best bulbs and kits to fit your vehicle. Today we take a look at and compare laser headlights vs LED headlights. LED headlights are becoming more commonplace today, especially on high-end cars. However, German automaker BMW is bringing to market laser headlights. BMW claims that laser headlights are the next logical step in automotive headlight development. Laser headlights have the potential to be simultaneously more efficient, more powerful, and also smaller in size than other types of headlamps. The advantages of laser headlights are quite compelling. First, they offer a near parallel beam of light that is up to 1,000 times more intense than LED headlights, but utilize less than half of the energy. Next, laser headlights provide 170 lumens of light output per watt, while LED headlights only output up to 100 lumens per watt. Both headlights are still significantly more efficient compared to a traditional household light bulb. For example, a 100-watt bulb only makes about 1,000 lumens of illumination. According to BMW, laser headlights can reach twice as far as LED headlights, or about 1,970 feet (600 meters). The laser diode that is used in laser headlights array are a mere 10 microns long. On the other hand, LED headlights have a side length 100 times bigger, at 1 millimeter. So, while the lasers themselves are tiny, BMW says that their laser headlights retain their traditional dimensions and surface area, and also continue to contribute to the aesthetic styling of a BMW. That being said, the laser headlight assemblies are shallower from front-to-back, thus allowing them greater flexibility in the placement of the headlight housing. The smaller size also means less intrusion into the vehicle’s engine compartment. BMW says that laser headlights are safe, because the illumination of the headlamp is indirect. Their blue laser beam is also converted into a pure white light by use of a fluorescent phosphor material. BMW claims to also be able to implement a few of their optional safety features. These include auto-dimming (Anti-Dazzle High Beam Assistant), automatic pedestrian illumination (what BMW calls Dynamic Light Spot), and also steerable headlamps (aka Adaptive Headlights). Rather than shooting the laser beam directly onto the road, BMW’s laser headlights focus their laser diodes onto fluorescent gas. This process produces a light 10 times brighter than traditional halogen headlight bulbs that are found on most cars. Working along with camera-aided software, BMW’s laser headlights produce a substantially more focused light beam in order to “reliably eliminate” any potential blinding effects to oncoming drivers. Should you be concerned that the new BMW will now blind you and everyone else on the road? No. In fact, as of the time of this article, laser headlights are not yet legal in the U.S. According to an adviser and attorney for the NHTSA, Thomas Healy, there have already been some complaints about overly bright headlights on the road. However, most of those complaints are caused by poorly installed conversion kits which allow other drivers to place an intense HID bulb inside of the headlight assembly on an older vehicle. We should note that Audi is also working on their laser headlights. In fact, they displayed them in January of 2014 on a concept car at the annual Consumer Electronics Show. Audi, a Volkswagen Group subsidiary, in 2008 was the first to debut an all-LED headlight. However, BMW will be the first to place laser headlights in a production vehicle. Way back in 1962, the standard halogen headlight was introduced and it quickly became required throughout all of Europe. That was thanks to its 1,000-hour life span. However, the traditional electric filament operated very hot and tended to burn out quickly, so it’s use was banned in the U.S. until 1978. Ever since then, halogen headlights have become the norm, partly because LED headlights are too costly for most mid- to low-end vehicles. While we generally focus on automotive HID lights here at LightHeadz, we would like to take this opportunity to talk about replacement LED bulbs found both on your car and in your home. At the beginning of 2013, the government instituted rising efficiency standards. These new standards mandated that manufactures stop producing 75W incandescent lights. Due to these new regulations, putting out less than 15 lumens of light per watt simply doesn’t cut it anymore. Fortunately, replacement LED bulbs are looking more positive than ever, with quite a few energy-efficient modelts offering light outputs very comparable to their older incandescent predecessors. The folks over at GE Lighting offer a wide selection of replacement LED bulbs for healthcare, retail, office, hospitality, home and commercial lighting applications. Their replacement LED bulbs have the practical and aesthetic qualities of conventional incandescent lamps, as well as being very energy efficient and having long life. Longer life and energy efficiency equals fewer lamp replacements vs. halogen and traditional incandescent light bulbs. Furthermore, the new replacement LED bulbs don’t contain any mercury or lead and are RoHS compliant. To date, GE’s Infusion LED Module System is believed to be among the most flexible LED lighting products available to OEM’s, designers, and end users. A wide range of lumen (brightness) packages are available with the GE Infusion LED modules, allowing them to meet all sorts of lighting needs for commercial, office, retail, healthcare, or hospitality lighting applications. Good replacement LED bulbs make use of the vehicle’s factory lighting fixture and therefore should not damage any part of your vehicle’s lighting. In order to ensure that the bulb has the highest possible light output, most high quality replacement LED bulbs use German diodes. Unlike lower cost alternatives, German replacement LED bulbs will not fail prematurely or flicker during operation. It should be noted that not all replacement LED bulbs are manufactured to the same equal standards. When it comes to your car’s LED lighting, don’t sacrifice your safety with cheap replacement LED bulbs. As long as you start by purchasing higher quality bulbs, it should be the only replacement LED bulbs that you will need to buy for your car as LED’s are rated for over 50,000 hours of normal use. LED bulbs use less power than the traditional filament style light bulb. Keep in mind that on some vehicles you may need to install a load resistor in order to avoid getting error codes or a “fast flash”. Check out this cool video showing the many different kinds of automotive replacement LED bulbs available, including LED headlight bulbs. The first step to installing replacement LED bulbs is to locate the proper size, type, and color of LED bulb that you would like to use. There are literally hundreds of different types of LED’s available today, so it may be a bit tricky for you to locate the specific one you are searching for. It’s probably best if you take the burned out bulb to your local retail store. They should be able to point you in right direction for a suitable replacement LED bulb. So as not to break the old bulb, be sure to remove the it carefully. In most cases, you will need a screwdriver for this because LED lights are typically encased in some sort of housing. Remove whatever encasing there is, first. It’s important to keep the screws that you removed, as you will obviously need to use them when you put the case back on. It’s a best practice to read the manual that came with the replacement LED bulbs. While most LED lights can simply be pulled straight out, there are others that have certain ways in which they may connect more securely. That’s why it’s best to read the instructions or manual on the new LED bulb. Next, replace the old bulb and insert the new LED bulb. The new LED bulb should go in the same way that the old one came out. It’s a good idea to test the light prior to putting the encasing back on. You want to make sure everything works and that the light is color and brightness that you wanted. Finally, you want replace the case that was covering the LED lights. Be sure that the casing is screwed down and secured tightly. Remember, if you are looking to compare xenon vs halogen headlights, check out our headlight showdown. Halogen headlights are not really a new technology, unlike HID (High Intensity Discharge), or Xenon lights, halogen headlights and LED headlights. Instead,halogen headlights are a refinement of a much older, already existing technology. Halogen headlights bulbs are a variant of the much more traditional incandescent light bulbs that have been around and used since the very early days of the electric light. In order to produce light in an incandescent bulb, an electrical current is applied to heat a filament in a glass bulb until it gets hot enough and glows. The halogen headlights bulb is either filled with an inert halogen gas to prevent the filament from oxidizing or it is evacuated (has a vacuum). The very first light bulbs, such as those developed by Thomas Edison, implemented a carbon filament. However, in 1906 the tungsten filament was introduced. The new filament produced a much brighter light and also lasted longer. Not surprisingly, around the same time frame, automobile makers began replacing acetylene lights on cars with electric lighting using incandescent halogen headlights bulbs. For most of the 20th century, the mainstay of auto lighting was the tungsten filament bulb. However, that bulb was not without its problems. During normal use, the tungsten filament in the bulb evaporates, and the hotter in temperature that he bulb operates the faster it evaporates. This means that the brighter that the light burned, the quicker it died. It was discovered that by using an inert gas such as argon, instead of a normal vacuum, would be able to prolong filament life. However, since the gas would also cool the temperature of the filament it would reduce its efficiency. Bulb blackening was yet another problem with the old tungsten filament bulbs. The tungsten filament would condense on the inside surface of the headlight bulb, as it evaporated. This blackened the surface of the bulb and therefore reduced the light output. Instead of an inert gas like a traditional conventional light bulb, a halogen headlights bulb contain a halogen element such as bromine or iodine. The filament and the halogen gas combine to produce the halogen cycle, which is a chemical reaction that redeposits evaporated tungsten on the bulb’s filament. This prevents blackening, and also increases the life of the filament, thus prolonging the bulb’s useful life. A higher halogen headlights bulb operating temperature is required, however, for the reaction to take place. This is the reason why the halogen headlights bulb is made of fused quartz, which is a high melting point glass. This is why they are sometimes also known as quartz-halogen lights. Due to the fact that quartz is so strong, the gas pressure inside of the halogen headlights bulb can be increased, thereby reducing the rate of filament evaporation. This also allows the bulb to be operated at a much higher temperature without any significant reduction in it’s lifespan. Halogen headlights have more bulb clarity and a higher operating temperature which results in increased light output. Halogen headlights also more efficient than conventional incandescent headlight bulbs. This is because they produce more light using the same amount of power. In Europe in 1962, the very first halogen headlight bulbs for cars were used. They became legal for use in the United States in 1978. Today, halogen headlights bulbs are most often used for both fog lights and headlights. This is because their increased light output expands driver visibility in inclement weather and darkness. Halogen headlights bulbs are available in varying degrees of color and brightness ranging from yellow to blue to bright white. Today, the majority of cars on the road are equipped with halogen headlights. Just like any other type of light bulbs, halogen headlights will eventually burn out and need to be replaced. While you can certainly replace your headlight bulbs with OEM lights, you can also choose to upgrade to a higher intensity halogen headlights bulb. The benefits of doing so are that the headlight will emit a brighter light, thus making it easier for you to see at night while on the road. Installing halogen headlights take only a little bit of time and they are just as easy as installing the OEM headlights. First, make sure that your car and your headlights are turned off. Open the hood on your car. Remove the halogen headlight casing by utilizing a screwdriver to unscrew the bolts that hold it into place. Depending on the type of vehicle you have, not all screws may be easily visible and there may also be a bolt underneath your car. If so, you should use a jack to lift your vehicle and give yourself some extra room. Next, remove the headlight bulb retainer from the casing by reaching your had behind it and twisting the halogen headlights retainer in a clock wise motion. Now you can disconnect the headlight bulb from the electrical unit by pressing downward on the plastic tab. Now you should wear a pair of gloves and unplug the old bulb. Next up, insert the new halogen headlight bulb into place. Once in place, reassemble your headlight bulb retainer and also the headlight casing unit. That’s all there is to replacing halogen headlights. Be sure to check out our xenon vs halogen comparison. There have been a lot of advances in headlight technology since their origins as acetylene lamps back in the 1880’s. While halogen bulbs are still the most popular and commonly used today, Xenon HIDs are increasingly growing in popularity. That being said, the newest car models are more and more beginning to implement LED headlight technology. Some manufacturers, such as Audi and BMW, are even starting to experiment with laser headlights. Today, we will compare LED vs. Halogen vs. Xenon headlights and we will discuss the advantages and disadvantages of each technology. 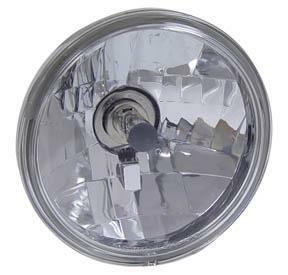 As we mentioned earlier, halogen headlamps are currently the most widely used in the automotive world. This is primarily due to two factors. First, their primary advantage is that they have a very long lifespan. Under normal conditions, a halogen light bulb has a lifespan of approximately 1,000 hours. Halogen’s second advantage is that they are relatively inexpensive to produce, thus making replacement costs relatively very low. While halogen is still the most commonly used headlight, that fact is slowly starting to change as manufacturers shift towards other technologies. Reason being that halogen bulbs are less efficient than their new counterparts. In order to help us understand why, let’s examine how halogen light bulbs work. Halogen lights contain a gas, usually a combination of nitrogen and argon, and a tungsten filament, that are encased in a glass tube. The glass is made to resist extremely high temperatures. When the light bulb receives the electrical current from the car, this heats the tungsten filament. Temperature of the filament can reach up to 2,500 degrees Celsius. Heating the filament to this high temperature starts the incandescence process, thus creating light. This is where the inefficiency of the light exposes itself. In order to generate the bright light, the halogen bulb also produces a large amount of heat. This heat represents wasted energy. High intensity discharge headlights, otherwise known as xenon or HID, contain a combination of gases and rare metals that are heated to generate a bright white (or blue) glow. Xenons are roughly two to three times brighter than traditional halogen bulbs and some people feel that their glare can be distracting for other drivers on the road. HID lamps, which require less power to operate, actually output a brighter light. Drawing only about 35 watts of power, they generally are good for about 2000 hours of life. This makes xenon lights more efficient than halogen. HID headlights get their nickname, xenon headlights, due to the fact that they contain a trace amount xenon gas. The xenon gas not only prevents the car’s HID lights from flickering when the driver turns them on, it also ensures that an ample amount of light is provided before the headlamps reach their maximum brightness. This typically happens within a couple of minutes. One can easily spot xenon headlights by their cool white glow, which is usually accompanied by a distinctive blue tinge. On some car models, they implement HID lighting only for their low beams, while the high beam light is provided by a separate set of halogen lights. For vehicles with bi-xenon headlights, the HIDs provide both the low and the high beam from the same enclosure of xenon lights. Now mainstream and available as an option from most automobile manufacturers, HID xenon headlights were first available in the mid-1990s. Prices for xenon bulbs have remained slightly high, due to their use of rare elements. This has lead car makers to seek out and invest in other technologies. Just to note, some bi xenon headlight bulbs could have a negative impact to our health. It may not be widely known, but some versions could contain hazardous substances, for instance the metal mercury. Of course, some countries have imposed strict rules and regulations that prohibit the use of these materials. However, banning such materials will only increase the cost of production. As the automotive industry continues to evolve, headlights in particular are advancing rapidly. In a very short period of time, headlight technology has reached a whole new level. After HIDs had been on the market for a couple of years, car manufacturers began to analyze a new, even more energy efficient option called LEDs. LED headlight bulbs on cars first appeared in 2004, and the first car that offered full LED headlights was the Audi R8. Many would argue that LEDs seem to be the most ideal solution for mass-produced automobiles. However, there are also several drawbacks with the technology that could change their perception about this type of lighting technology. The greatest advantage to LED headlights is the fact that they need very little power to operate. This is a huge advantage as we see more and more of a shift towards hybrid and full electric vehicles. LEDs are already being used on the Toyota Prius and on several other hybrids on which electrical power plays a key role – for more than the horn and headlights. Let’s take a closer look at some disadvantages. Unlike halogen lights, LED headlight do not emit heat while creating light. However, what they do is they create a small amount of heat towards the bottom of the emitter. This creates creating a potential risk for nearby parts, connective cables, and assemblies. While, for this reason, car makers may be generally avoiding utilizing LEDs for headlamps, they are instead adopting the LED technology for day time running lights, brake lights, and turn signal bulbs. Because light-emitting diodes are so small in size, they can be manipulated into a great many configurations. The shapes can be custom fit to nearly any conceivable design that the manufacturer can come up with. The amount of energy consumed by LEDs is believed to be in between the energy consumed by xenon and halogen lamps. Producers are making efforts to improve in this area in the future. Production costs remain a major obstacle for LED headlights. Significantly improvement in this area is needed, if they are going to be used more widely. Currently, LEDs are still fairly expensive and are usually only offered on luxury, premium vehicles. Perhaps our favorite of the bunch are the OPT7 LED headlight bulbs. So, now that we have compared LED vs. Halogen vs. Xenon headlights, which one is best? All in all, this question can not be answered directly. Different applications will require different forms of lighting. That being said, it will certainly be interesting to see how car headlights continue to evolve. We will be sure to keep you updated on new technologies.